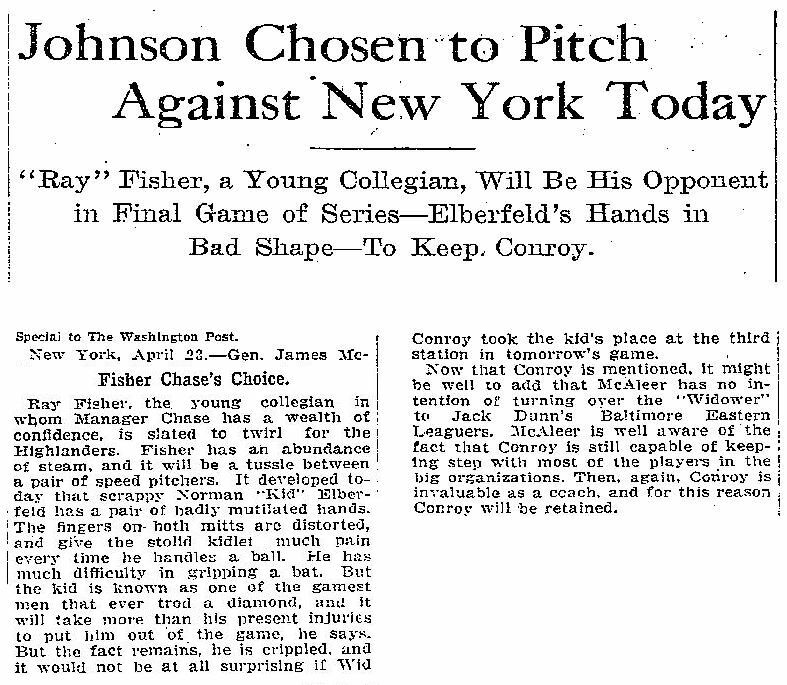 "Ray" Fisher, a Young Collegian, Will Be His Opponent in Final Game of Series�Elberfeld's Hands in Bad Shape�To Keeps Conroy. Ray Fisher. the, young collegian in whom Manager Chase has a wealth of confidence, is slated to twirl for the Highlanders. Fisher has an abundance of steam, and it will be a tussle hetween a pair of speed pitchers. It developed today that scrappy Norman "Kid" Elberfeld has a pair of badly mutilated hands. The fingers on both mitts are distorted, and give the stolid kidlet much pain every time he handles a ball. He has much difficulty in gripping a bat. But the kid is known as one of the gamest men that ever trod a diamond, and it will take more than his present injuries to put him out of the game, he says. But the fact remains, he is crippled. and it would not be at all surprising if Wid Conroy took the kid's place at the third station in tomorrow's game. Now that Conroy is mentioned, it might he well to add that McAleer has no intention of turning over the "Widower" to Jack Dunn's Baltimore Eastern Leaguers. McAleer is well aware of the fact that Conroy is still capable of keeping step with most of the players in the big organizations. Then, again, Conroy is invaluable as a coach, and for this reason Conroy will be retained.